One of a father’s most important jobs is providing for his children. He works hard to support them, teach them, and protect them. Unfortunately, there are many children today who are struggling to survive without their basic needs being met. They are growing up in homes where addictions, abuse, and violence keep them from being able to thrive and succeed. Kansas is passionate when he shares about the personal growth he has experienced while navigating through the journey of fatherhood, striving every day to be there for his children. “I know I’m growing as an individual and most importantly as a father. I know I’m not the best father, but I also know I’m not the worst. My children and I have been through a lot together because of various reasons, mainly because of my choices and actions I made as a boy,” he states. Today, Kansas is setting a loving example for his children. As one of our ambassadors and directors of our Leaders’ Society, he strives daily to be a positive impact and influence in both his children’s lives and the Native youth in his community. He hopes that as he shares his struggles and life experiences with the future generation, he can help inspire and guide them down a path that is free from addiction and full of possibility. 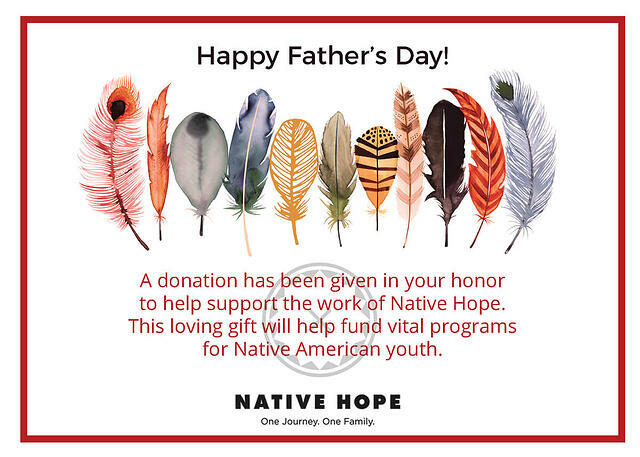 Honor your dad this Father’s Day by giving the gift of hope to Native American youth. Your donation will fund vital programs that provide education and counseling for at-risk youth, enabling them to find a way out and equipping them with the tools they need to succeed.